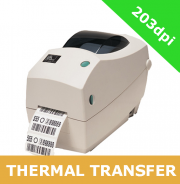 The Zebra LP2824 Plus direct thermal and Zebra TLP2824 Plus thermal transfer desktop printers are ideal when desktop space is an issue. They offer 203dpi printing resolution and come with a choice of either serial and USB interfaces or parallel interface, but models also provide ZebraNet PrintServer network connectivity as an option. With a maximum print width of 56mm, the Zebra LP2824 Plus and Zebra TLP2824 Plus desktop printer compact size means they can fit anywhere.